Discussion in 'Star Wars: The Rise of Skywalker' started by DailyPlunge, Apr 13, 2019 at 4:53 AM. For those that didn't read Fortress Vader you can go to Wookiepedia to find out more, but Lord Momin was a powerful Sith Lord whose physical body was destroyed, but his consciousness survived inside a mask. I won't spoil the fantastic comic, but Momin attempts to return to life. So it's canon that a Sith Lord's consciousness could survive inside a Sith relic. This would be something Palpatine would know about. It's very possible Palpatine's consciousness is connected or tied to the remains of the second Death Star. 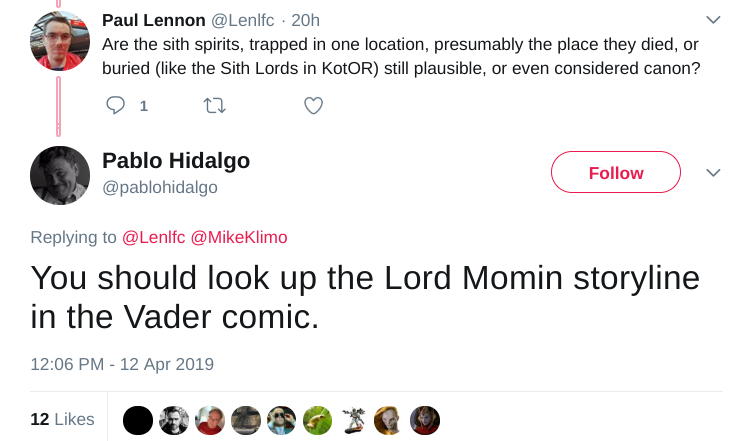 This is a fun topic to speculate about because we know in some way, shape, or form Palpatine involved in The Rise of Skywalker. Is Palpatine consciousness attached to a relic? Is that relic the Death Star. Is there race to find the relic? I like this idea. It makes tangible sense. The example from the that comic is perfect. Rather than add a new twist for how Palpatine cheated death drawing upon the canon set up in those comics is a solid theory. Also going back even further if I rember correctly the Lando mini series also delt with Sith Artifacts & the Acolytes of Beyond we’re obsessed with sith possessed masks in the Aftermath novels. If what we know about the Sith and their ability to tie their consciousnesses to artifacts does play a part in Palpatine's return (which seems likely), there is a missing piece of the puzzle because he will end up succeeding where Momin and others failed and returning to his actual body. He might not be, personally, but others are, and there is no longer a "disconnect" between filmic and "non-filmic" Canon. Since Sith are all about attachment, I can see how a very powerful dark presence can be tied to a place or to an object until that object is "cleansed". This reminds me of Yoda's Clone Wars arc on the Sith homeworld when he meets Darth Bane's ghost. This could further tie into the LOTR story similarities we can sometimes find through monomyth. Maybe there is something akin to Sauron's one ring that keeps Sidious's presence on a world where he makes that world sick and turbulent with his darkness. Sauron was defeated and his physical form was destroyed but his power lingered on in the one ring that tempted and tormented its users through intense psychological attachment to it and a covetous obsession with it when they don't have it. You're right about JJ, but Kennedy mentioned that there was a plan to bring Palpatine back for a long time and the question was how to do it. This is one of those cases where Lucasflm has a few ways to do this in canon already and JJ was curious how to do it. They don't have a choice; Canon is "the things a storyteller has to pay attention to and acknowledge". Would be a great possibility. But I don't believe Palpatine will be physically alive in EP 9. He can be in it a lot of ways though that brings about evil. Maybe he doesn't want his actual body b/c it was melted by Samuel L. Jackson? He has plenty of other people to 'splain it to him. The Momin arc is pretty fun to read. But i dont think Palps is around in anyway at all. Hes probably going to be seen in an old holovid or in a force vision. I will say Momin reminds me of Kylo to an extent. They are both very different but both have some similarities. Wearing masks (which I'm not sure if momin needed to wear one or if he did just for intimidation or protection). They both are very erratic and also insecure. Kylo is obviously insecure but I think Momin might be also due to his borderline delusional overconfidence. Both Momin and kylo were outcasts as kids, Momin to much more extreme extent. Both did not adhere to sith philosophy. Momin was regarded as sith but his beliefs and ideals were so odd that Sith didnt ever pass on his teachings. Both Kylo and Momin dont have apprentices, but darkside adepts they lead. Momin was more insane than insecure but he surely didnt accomplish as much as he could have. Seems kylo is struggling with that as well. Both are just immature in different ways for their age too. Momin was way more evil than kylo and had no temptation to the lightside, but when I read the Momin arc it did remind me of Kylo. But i dont think Palps is around in anyway at all. Hes probably going to be seen in an old holovid or in a force vision. Ian McDiarmid is a full-fledged part of the film's cast; this has already been confirmed, as has Palpatine's general role in the film. They didn't fly Ian out to England for filming and then Chicago for an appearance at Celebration based on a 'glorified cameo', which is what Palpatine appearing as a hologram or vision would essentially be. If thats the case, my guess is we will get a Force Ghost Palpatine. I hope they dont bring him back in another physical body honestly. Sith can't become Force Ghosts. What happened in the Legends EU is irrelevant. Sith cannot Canonically become Force Ghosts. Not really. The storyteller just can’t contradict current canon. JJ’s movies can’t contradict canon from novels and comics but he does not have to incorporate their themes or tie in characters from those sources. In TFA he used Snap Wexley from the Afermath series and that was the only tie to non-movie canon and if I remember correctly he had Grunberg cast as an Xwing pilot and it was one of the story group who suggested he make him Snap. JJ’s focus seems to be to tie all 9 movies together so I don’t necessarily see him looking to the comics or novels for ideas. Did Lucasfilm ever reveal what footage in the movie is from Lord and Miller?